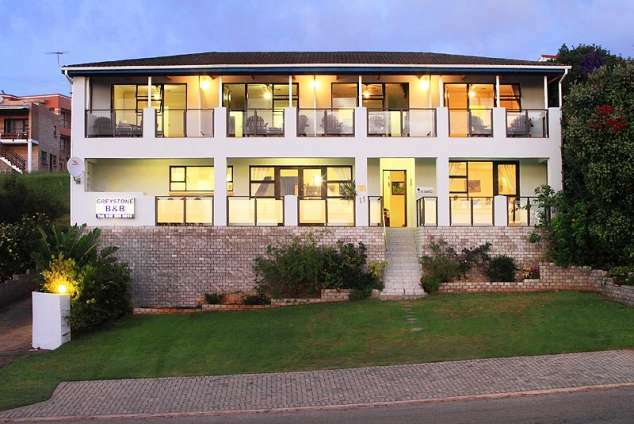 Greystone Guest House - Jeffreys Bay Accommodation. Credit card facilities are available at the Guest House, & there are banks approximately 100 meters away. Greystone Guest House is ideally situated 300m from the "Supertubes" surfing beach of Jeffrey's Bay, a holiday paradise. Enjoy a holiday in Jeffrey's Bay. Stroll the sunsoaked beaches and collect shells or visit the new Shell Museum. Watch dolphins and whales play (May to September) or go fishing. Sports enthusiasts can enjoy scuba-diving, windsurfing, ski-boating, surfing, and more. Take Day Trips to Port Elizabeth, Addo Elephant Park, Shamwari Game Park and Tsitsikamma Nature's Reserve, or play a game of pool. Sit and relax in the sunroom and read or send an e-mail to your friends or just relax and enjoy the hospitality of your hosts. Greystone Guest House offers you 8 tastefully decorated en-suite rooms. The 4 front rooms, open onto a balcony with magnificent sea views. 2 en-suite with corner baths and queen size beds. 2 en-suite with shower and one with a queen size bed and one with a queen size bed and a single bed. 4 smaller rooms en-suite with shower and either a double bed or 2 single beds. All rooms with separate entrances. Downstairs is the guest dining room, lounge, games room with pool table, braai (barbecue) area. Off street parking. Generous breakfasts. Airport (Port Elizabeth 77km from Jeffrey's Bay) - Transport can be arranged at a nominal fee. 49013 page views since 03 Feb, 2000.